My new favorite place in my house is our “maker space.” Some members of my family might prefer to call it the garage, but I prefer to see the possibilities. There’s just something about working in a really humble place that grounds you and makes new ideas flow. Monday through Friday I have my two littlest “work” with me. It is so freeing to have a place where we can just be. I can make things, Kate can work with me, and Leo can play. Sure there are times I have to remove Leo from the table, or make sure he’s not climbing on a chair in the other room, or coloring with Sharpie on kitchen cabinets. Yes he did do that, occupational hazard of a creative household… But I just can’t tell you how much it inspires me to be able to be me, and do what I love, and be surrounded by the joy they bring. Here’s Anthony’s maker space. He does it all right here :) I love that we have that love of making stuff to connect us. September will always be the month I host my cuff event. This year was particularly exciting for me add new inspirations!! This is how leather happened, and also a window on the crazy road trips my brain takes. I, at the moment, can no longer find my large sterling silver blanks to hammer into my Emily Earrings. This frustrates me to no end. I’ve looked and looked, but the largest I can currently find are 1” from point to arc. One day I was feverishly searching for sterling silver tear drops and I found leather tear drops! And I thought!! AWESOME!!! I’m going to give these a go. The teardrops arrived and I loved them, but all of my other impulse leather purchases fell flat. I love these. Thick pale grey suede, full of texture, and understatement. I am just so excited about introducing leather! So then I remembered a beautiful piece of leather I use in my displays, it had never once occurred to me that I could use that for jewelry! !… So I started cutting it up! and new ideas were formed… Then I thought I bet I could find really cool scrap leather and make pieces out of that, and BOY WAS I RIGHT!!! 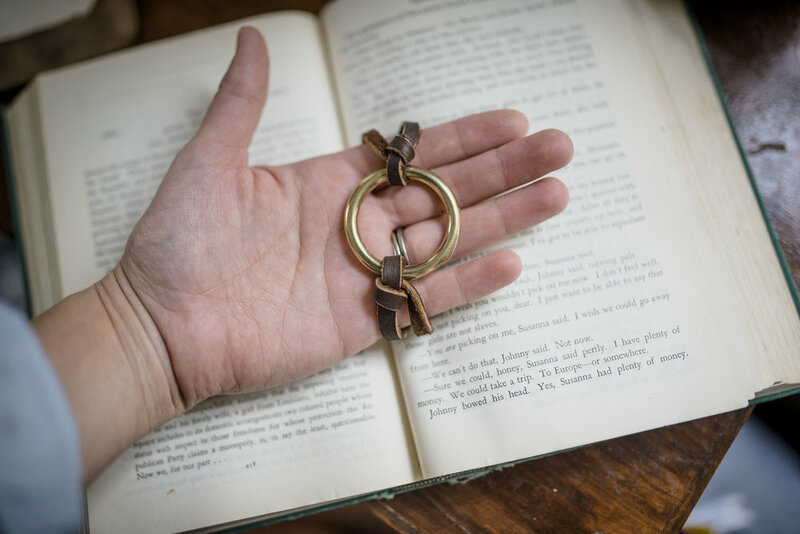 This heavy brass ring has my heart. You will be seeing it a lot of places. You will be seeing a whole … lot… of leather this fall into winter!! I am so excited about my new pieces! I cannot wait to show you! I also can’t enough of brass rings. Sometimes my gut falls in love before my head knows why. Once I figure that out I will definitely be telling you about it!! And nothing has changed. Brass is still my go to favorite! These are going to be my fall go to. They weigh almost nothing and have plenty of motion and interest. Thank you for reading!!! I hope you have a wonderful week! !